Thank you! I am addicted to these one pot recipes!! 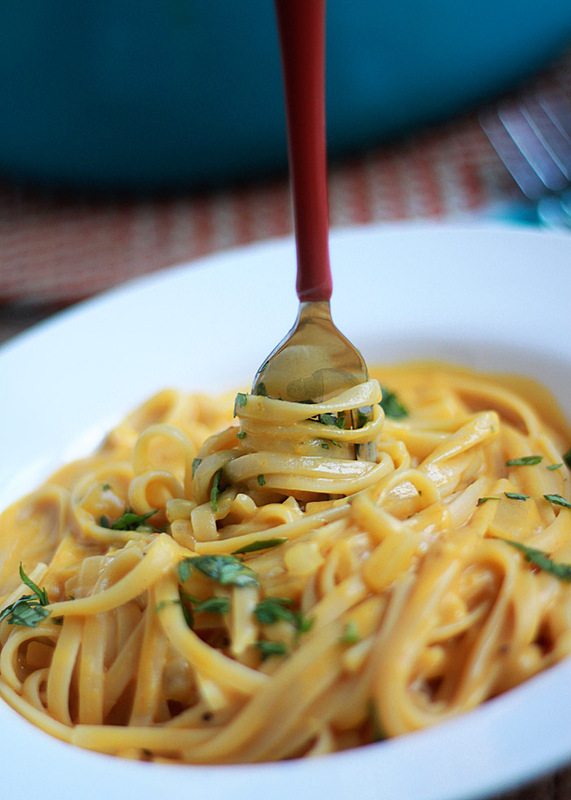 Wow this pasta looks so creamy and delicious! I’ve pinned the recipe to recreate at a later stage.. great recipe! I just ‘stumbled upon’ your blog and am so glad I did. I have been eyeing these one pot pasta recipes for a while but haven’t gotten around to trying one yet. This is the one I’m going to try. In my opinion you can never have too many pumpkin recipes. And this one looks AMAZING. 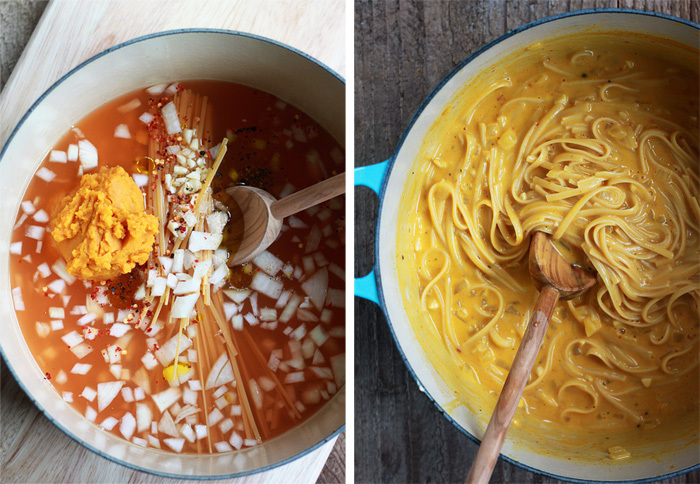 I love the idea of one-pot pastas. I wonder if this technique would work with gluten-free pasta, or if the whole thing would end up being a gloppy mess? Ok…seriously…these pictures make me drool. I need to control myself..or just prepare this insanely looking dish! Login’ it!!!! I’m excited to give this a shot. Do I bring the pot to a boil with the lid on or off? Or does it not matter? This pasta looks so dreamy!! True but sad that I have still not tried one pot pasta wonder!! Well better late than never!! Thanks for the inspiration!! 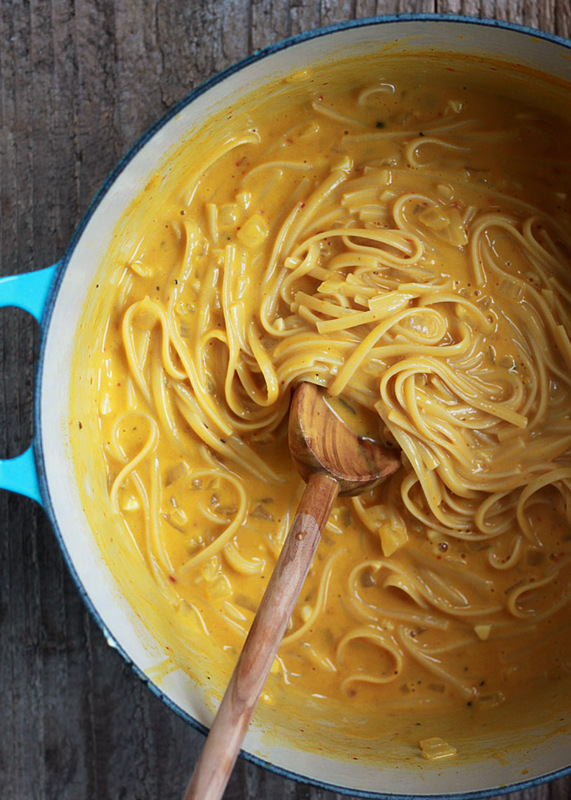 Oh goodness…this pasta looks AMAZING! Definitely putting it on my meal plan for next week. Yum! Love that it’s all done in one pot. I have yet to try a one pot pasta. Great photos! I’ve never made one pot pasta. I always finish cooking my pasta in the sauce, so that it absorbs more flavor, so why not cook it the whole way in the sauce, so that it absorbs all the flavor?!! Looks de-lish! Found this recipe on Pinterest and just got done making it. Seriously, to die for, yummy! It’s going to be my new go-to Fall meal. i made this Saturday and it was AMAZING. My friend made this for dinner the other night and it was a hit. I want to make it for a larger group. Does it work to double the recipe? Hi Terra, I’m so glad it went over well! I haven’t doubled the recipe but I don’t see any reason why it wouldn’t work. My only advice would be to use a VERY roomy pot! Please let us know how it goes. @Sondi, Just made tonight with GF Corn pasta: Looks amazing, I would recommend cutting your liquids by a cup (3 c. broth) as there is not as much ‘pasta starch’ to thicken up the sauce! I made this tonight and it was amazing!! My two year old and husband (who is a meat lover) ate it up quickly too. I made it with rotini pasta instead so it was easier for my son to eat and I didn’t have to change the recipe/cook time. Thanks so much for the easy and tasty recipe! I just made this tonight and it was a major hit!! I had never made a one-pot pasta dish but I am so glad this was the one to introduce me. I actually ended up doubling the crushed red pepper and then also cooked some peas up in the microwave and threw them in and it was divine! do you think I could add some tofu for extra protein?? Sure, though I’d probably cook it separately and serve it alongside or stir it in at the last minute. It would probably be good with crispy salt and pepper tofu! This was so easy and tasted so good and special! I made it for just my hubs and I and he loved it! We had leftovers for lunch tomorrow which I’m looking forward to! Thanks for the great one pot meal that’s tastes like a pro made it! Team Cilantro here: this loooks soooo gooood. I will seriously have to make this. 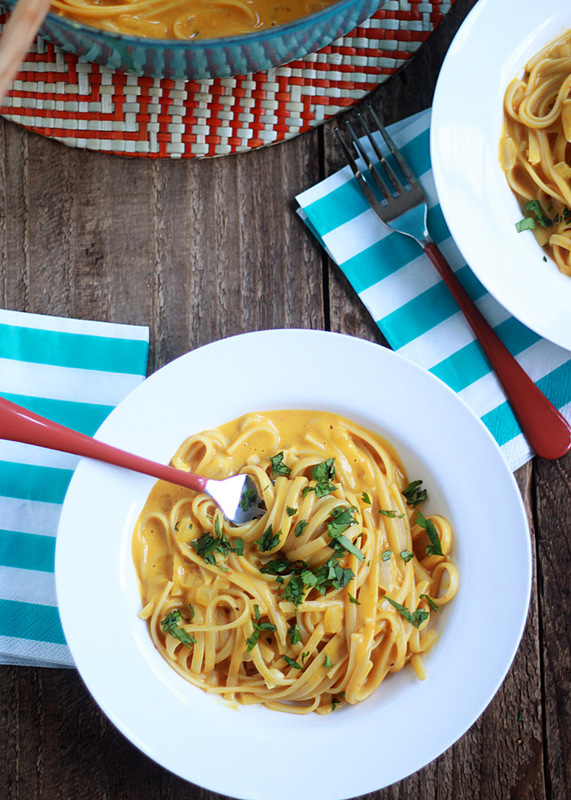 I love creamy pasta and I have never though of adding pumpkin in this way. We loved this!!! We’ve already made it twice in our home…can’t wait to have it several more times this fall. Made this using 8 oz rotini pasta and instead of goat cheese I used Neufchâtel cheese!!!! It is simply AMAZING!!!!! this definitely works for gluten free pasta, too! I made it tonight and it is to-die-for! I just had to cook it a bit longer since GF noodles don’t cook as quickly. Awesome! Thank you so much for sharing – great to know for our GF friends! Do you think there is any way to make this in a slow cooker? I have a pasta pot, but it is pretty lightweight and not huge… I could try it in my pot, but don’t want to end up with a huge mess on my hands (and my stove!). Hi Michele, many recipes can be adapted to the slow cooker, but this is definitely not one of them – sorry! :\ You could try a more traditional preparation by sauteeing the onion first, then simmering with the remaining ingredients (except pasta). Then cook the pasta and add it at the end of the process. I made this yesterday and it was a hit! Perfect for October! Thank you for the wonderful recipes!!! 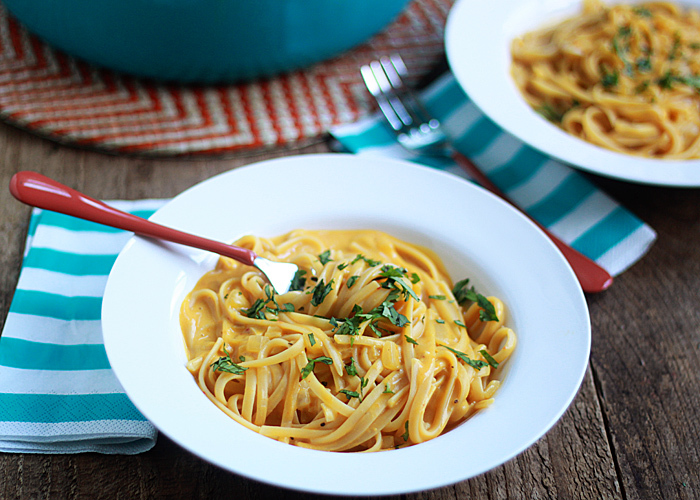 I’m crazy for pumpkin and pasta and this looks wonderful! Unfortunately, I dislike goat cheese immensely but immediately thought of subbing ricotta. I’m definitely going to give this a go using whole milk ricotta. Thanks for the inspiration! I just made this but used cream cheese instead of goat cheese. It tastes DELICIOUS and the texture and consistency are great! Thanks for the recipe! Just made (and inhaled) this tonight. What an easy, great meal! I used whole wheat penne, beer instead of wine, and added a couple handfuls of frozen chopped kale. So delicious! Thank you!! 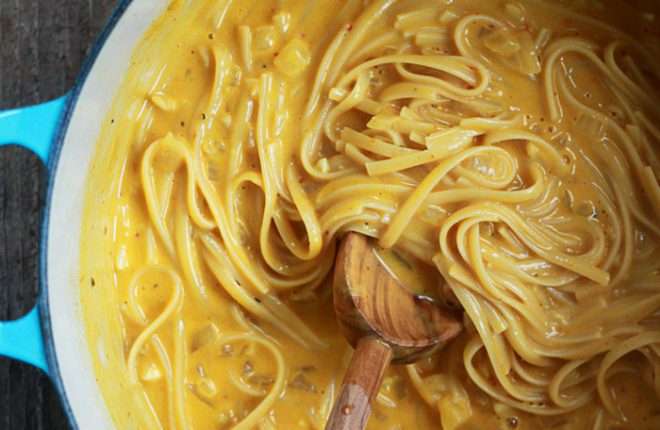 Would butternut squash work instead of pumpkin? I have one I need to use up. Also thinking of using cheddar instead of the goat cheese so I can sell it to my kids as mac and cheese. Made it tonight & it was so good! I’m thinking next time I make it I’ll try the truffle chèvre. How decadent would that be? Just made this tonight, and substituted Daiya cream cheese because I can’t do dairy. The sauce was great, and the Daiya worked beautifully to thicken although it has a slightly sweet flavor, so I would probably up the spices next time to compensate. I may have overcooked the pasta a bit – it felt like it took a long time to start boiling, should all of your liquids be at room temperature first for the timing to work out correctly? It wasn’t mush, but at the end of nine minutes, it was definitely more done than I normally make. Any substitutions for goat cheese? Sour cream is really good. Mascarpone or cream cheese would probably work, too. It’s also decent without adding that at the end at all – it just won’t be quite as thick. I made this tonight, except I didn’t have any goat cheese on hand. I added a splash of heavy cream and this still thickened up nicely. This is the first time I’ve done a one pot recipe and it’s delicious! Thanks! Yum! Love trying new dishes! Had open boxes of rigatoni and elbows so just combined those. Put in a pound of pasta with the same amount of sauce, which ended up being a great amount! Didn’t have nutmeg, so used cinnamon instead. So good! I would definitely recommend putting in cinnamon, even if you have nutmeg, too. Also put in shredded mozzerrella instead of the goat cheese. Still delicious, but I’m sure goat cheese would go even better. Tastes like savory pasta pumpkin pie. You need to try this! I agree that this was my favorite recipe of 2014. I make it all the time. It’s my favorite on all of Pinterest for 2014. I’ve tried some of the adjustments mentioned in the other comments but the original remains my favorite. I tried to click on the link for the 20 vegetarian one pot and skillet meals, but it says page not found. Is there an updated link? Whoops, there was a typo in my link! Thank you for the heads-up. It’s fixed now. 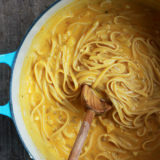 Can you use canned pumpkin instead of the puree? This looks amazing!! This was creamy and delicious. My kids found it just a tad too sour for their tastes. I think next time, I’ll start with 2 oz of goat cheese and then maybe add a little milk/half and half if it needs more creaminess. Thanks for an easy and healthy one pot meal! This was the first one-pot pasta I’ve ever made and it was divine!! The goat cheese was a wonderful touch and it was SO easy! Thank you for the recipe! I also added in some Quorn “chicken” cubes and it worked perfectly. I’ll definitely be making this more often! What can i add instead of the wine? I would like to make this for a cooking class and alcohol is not allowed!! Looks amazing! I’ve tried the original recipe, and it wasn’t a big hit in my house. Too spice, too chewy, too…. not quite right. This one looks fantastic though! I think I’ll take some time and cook up the garlic and onion before I add it all together to boil though. I think that will help bring out the flavors and ensure that the onion and garlic are cooked all the way through (a problem we had with the original). Hi Myrna, do you mean the original one-pot wonder with tomatoes, basil, etc.? I love it but I do think that it’s different than your traditional pasta dishes. 🙂 If you found that one was too spicy, definitely please scale back on (or omit!) the crushed red pepper flakes as they add quite a bit of heat! Hope you love this one as much as we do. This looks delicious! Is there anything I can substitute for the white wine? Just add about 1/2 cup more broth. It will still be great! Wow that looks absolutely amazing. I was wondering what to make for weeknight dinners the up coming week, now I know exactly what I’m doing – this is a little crock pot of heaven right there! I just cooked this tonight. I have to say, I doubted it would really get thick, but it did! It was very, very good. Like comfort food. I did a couple of things differently. First I used whole wheat pasta, so I cooked it for 10 minutes. Next, I didn’t have a regular onion so I chopped up 3 large green onions. Lastly, I didn’t have goat cheese so I used feta instead. YUM! (Also, the bottle with my red pepper flakes kinda slipped and I put a little to much in there…. added two handfuls of frozen sweet peas after the cheese and parsley. They thawed out beautifully and provided a really neat crunch!) I have put this in my “go to” book. Thanks for sharing this recipe. I’m like most people and think of pumpkin as a pie ingredient. This recipe has changed my thinking! Mmmm I may have to break my low carb diet to indulge in this soon!!! I am making this right now, the vegan version. Can’t wait to see how it turns out!